This entry was posted on Monday, April 11th, 2011 at 11:31 am	and is filed under Blog. You can follow any responses to this entry through the RSS 2.0 feed. You can leave a response, or trackback from your own site. 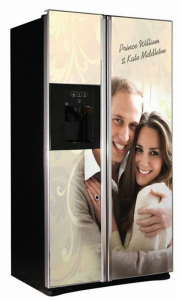 I am buying that fridge right now and I’m stocking it with Crown Jewel Condoms. The whole thing. Stuffed right to the ice maker. The fridge is probably now on mega-sale. I was just in London and every gift shop and street vendor was hawking royal wedding goods at 75% off. Also, a fridge chock-full of condoms is probably the best visual image, mmm, maybe, ever. You are full of the win. Thanks!